Recently, the media had been ablaze with the reports of an American soldier who, after walking into an Afghanistan village, shot and killed 16 civilians, most of them, women and children. America’s response was quick and calculated: He will be tried for murder and will receive the death penalty when proven to have committed the acts. Afghanistan officials want him tried in their country but either way, the soldier has been slated to die. The uni-polar decision to condemn this man for his actions, albeit somewhat justified, should be recognized as more than just a crazy man gone vigilantly; it should more appropriately be looked at as the result of a system that has taken our soldiers from people to property in the grand game of economic war paid for with the blood of those who are forced into endless tours of duty and the policies of death employed by the military industrial complex. When a drone kills innocent civilians, it is called an accident even when it was known the targets were civilians. When a lone soldier does so, it is defined as an act of murder by a mentally troubled person rather than by the machine he was trained to be. The soldier’s history shows that this was his fourth tour in the Middle East despite suffering a traumatic head injury in his previous tour. The day before he shot the Afghan civilians, it is said he saw his friend’s leg blown off leading to questions of PTSD (Post Traumatic Stress Disorder) and whether it contributed to his actions that day. In an attempt to disguise the scale and detrimental implications of our war in the Middle-East, our “leaders” promised no draft would be initiated, that only active soldiers would be deployed; but what cost to those soldiers who have been over deployed are we as a nation willing to pay? Many speaking on the subject have said that the defense’s claim of PTSD is fabricated; that the soldier was drinking alcohol with others the night of the attack and when combined with his domestic issues, he “just snapped”, completely discounting any accountability our Nation has for the real issue at hand: Our soldiers have been over deployed, away from their families, subjected to psychological trauma day after day and in some cases, even after injuries are suffered, forced back to the front lines to continue their journey through a pointless war. How many Americans are sitting in judgment of this one soldier when just months back, we heard these same hypocrites supporting politicians advocating that we should “bomb the hell out of Iran”? Is it acceptable for military leaders to advocate the killing of innocents but then to judge the soldiers in the ranks who carry out this sickening policy? If anyone should be arrested as a murderer, it should be those who have ordered the extinguishing of the lives of millions of civilians in the false names of freedom and Democracy, not the men and women who either follow orders or fall victim to the mental wounds of war. But civilians are often considered collateral damage to the American Military Complex. In this recent slaughter though, it has somehow become a high crime only to offer the soldier as a sacrificial lamb and distract us from how many other crimes are committed by special ops, black ops, drone attacks and CIA commanded death squads. To many soldiers, the “innocents” are enemy potentials and in the grand scheme of things, collateral damage victims waiting to be. Many though, suffer for this taught mentality as their human side combats their military weapon side which is trained to kill. 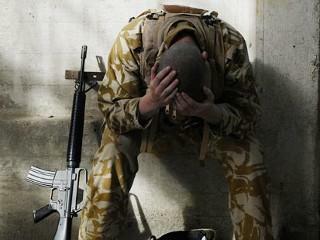 When this conflict occurs, soldiers are often unable to cope. "It’s complete negligence," says Lt. Col. Dave Grossman, a retired psychology instructor at West Point who trains law-enforcement officers and special-operations soldiers. "The military could train soldiers to talk about killing as easily as they train them to pull the trigger. But commanders are in denial. Nobody wants to accept the blame for a soldier who comes home a wreck for doing what his country asked him to do," he says. The emotional and psychological ramifications of killing are mostly unstudied by the military, defense officials acknowledge. "The idea and experience of killing another person is not addressed in military training," says Col. Thomas Burke, director of mental-health policy for the Defense Department. "Training's intent is to re-create battle, to make it an automatic behavior among soldiers." The more soldiers ignore their emotions and behave like trained machines rather than thinking people, the more you invite PTSD," says Dr. David Spiegel of the Stanford University School of Medicine. Far too many enlisted have been forced to return to war, where they should not have been. Even when those soldiers who have endured far too many tours, witnessing the brutal reality of war commit suicide, the powers that be try to paint them as mentally unstable instead of those suicides being an indictment of an errant policy. When those soldiers who have had enough and see now way out other than to commit suicide, they have in the past, been dismissed as mentally unstable and their families denied condolences for the loss of their hero. Our current President has changed this policy, though showing that maybe some real changes are coming. Suicide though, is only one of the detriments of treating our soldiers as commodities instead of people. The families left behind suffer for not knowing how long their loved ones will be gone and whether they will come home, alive. When videos are shown of a little girl or boy running to a soldier, crying, so extremely happy they have returned, we see the pain that had been suffered for their absence. We do not see though, on these media shows glorifying a safe return from war, the grief of those children who have to stand over a coffin, saying goodbye to their mother or father, knowing that they will never see them again. What stress level is to be assigned to this? Another issue is that of aggression acted out by soldiers who believe they are there, away from their children because of the enemy they are fighting. The level of hate against the “enemy”, especially considering the training of our soldiers to suspect any civilian of being a member of Al Qaeda or any other anti-American group, leaves the door open for violence without restraint. After all, the military has made it a policy to carpet bomb enemy targets without conscience, regardless of how many innocent lives are lost. We have done it time and time again and will most assuredly do it again. We all collectively now stand in condemnation of Staff Sergeant Robert Bales, a soldier facing a life ending sentence for acts perpetrated in the battle field. As the media attempts to cover up the reasons of these actions, many listen and believe the rhetoric only to dismiss their own guilt of supporting an unjust war and the tactics employed by a heartless policy meant only to further a sick, corrupt agenda. His actions though, are not the result of some mental disorder as they will say, but the affectations of a military which prides itself of creating killers for their war games in which we and our soldiers in uniform have become mere pawns and apparently, quite dispensable. “But war, in a good cause, is not the greatest evil which a nation can suffer. War is an ugly thing, but not the ugliest of things: the decayed and degraded state of moral and patriotic feeling which thinks nothing worth a war, is worse. When a people are used as mere human instruments for firing cannon or thrusting bayonets, in the service and for the selfish purposes of a master, such war degrades a people. A war to protect other human beings against tyrannical injustice – a war to give victory to their own ideas of right and good, and which is their own war, carried on for an honest purpose by their free choice – is often the means of their regeneration. The question I would pose to Mr. Mill though, is whether what we are doing in the Middle East and the increasing destruction we are inflicting upon our brave soldiers, their families and our National standing in the world in our war against terrorism, is an "ascendancy in the affairs of mankind" or a descent into the role of terrorists ourselves.